German audio specialist, Sennheiser, has come up with a new range of headphones. The G4me One , feature top-of-the-line noise cancellation technologies in the built in microphones in order to ensure clear communication during online or multiplayer gaming. 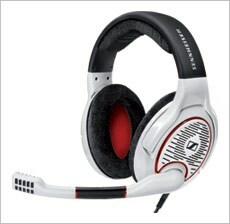 It delivers hi-fi sound, while letting air through to help keep ears cool during hours of gameplay. Focusing on Accessories, Amkette has launched new headphones in the Acoustix family. The colourful and funky headphones are available in two variants X10 and X12. Atom X12 feature the XBSS - Optimized Metallic Shell for pure, perfect and powerf ul bass. The Amkette Atom X10 headphones offer Balanced Sound Signature. These headphones come with one year warranty and are available in three jazzy colour combinations. 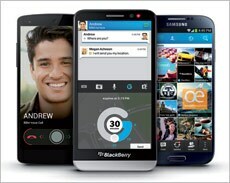 The popular BlackBerry Messenger app has a fresh update which adds a lot of new features. The new version brings free voice calls to BBM contacts over a Wi-Fi or data connection with BBM Voice, as well as access to BBM channels for Apple and Android users. Other features include simple file and photo sharing, location sharing, and Dropbox integration. CYGNETT, the leading name in the mobile and tablet accessory space, has launched a range of iPad Air cases in India. These include folio and stand cases with different functions and aesthetics. Inspired by the book jacket, minimalism, earth elements, origami and classic bespoke craft, there are four different products - Node, Cache, Paradox (texture) and Paradox (sleek). All these cases come with backcovers and provide all round protection. This is a surround sound device with 5000W PMPO that has two speakers and delivers powerful sound. The sub-woofer comes with a 6.5 inch full-range driver. The satellite speakers are powered by 3-inch full range drivers for high performance sound quality. The A530U has smooth connectivity with MP3 players, PC, TV, CD and DVD players. It comes with a built-in digital FM player. Gionee has launched the "GPad - G4", a 5.7 inch large phablet. It has a slim 7.95 mm aluminum body and comes with a 5.7 inch HD (1280x720) LCD display. It is powered by a 1.5 GHz quad- core processor and runs on Android OS v4.2 Jelly Bean. The smartphone has an inbuilt advance Smart Gesture control feature. It has 1GB of RAM, a 13 MP auto focus rear camera with LED Flash. D-Link has introduced a new wireless media streaming device that enables you to play music and games, watch movies, make presentations etc., from your smartphone, tablet or laptop onto any big screen. It can be plugged into the TV using HDMI cable. For accessing feeds on the mobile device, one has to download the D-Link app and conenct both the devices to the internet. This comes with 3 year warranty. 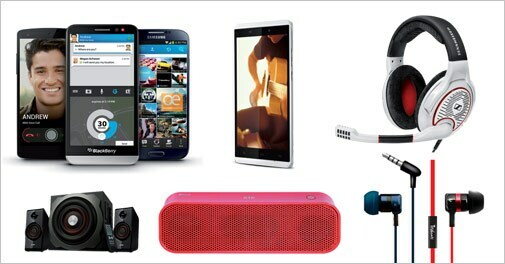 STK, the new player in mobile accessories in India has launched a colourful Bluetooth Stereo speaker. Supporting Bluetooth 3.0, this speaker packs a 500 mAh battery that can offer 5 hours of music playback with just 2 hours of charging. It packs in two 3W speakers and is available in two colours - black and red.